Thomas Sproull Dusinberre, as identified by his daughters. The photo is made around 1850. But Thomas was 15 in 1850.
nor his dad or grandfather had passed away by 1850. So why not take their own picture? Copies of images were usually made after someone's passing. In 1850 Thomas' father, Peter Dusinberre, was 48. But why get a sketch made and that copied. Peter's father, Daniel Dusinberre, was 50 in 1823. Perhaps the sketch is much older than this copy. Daniel passed away in 1857: perhaps he didn't feel up to the trip to the studio to have his portrait taken. 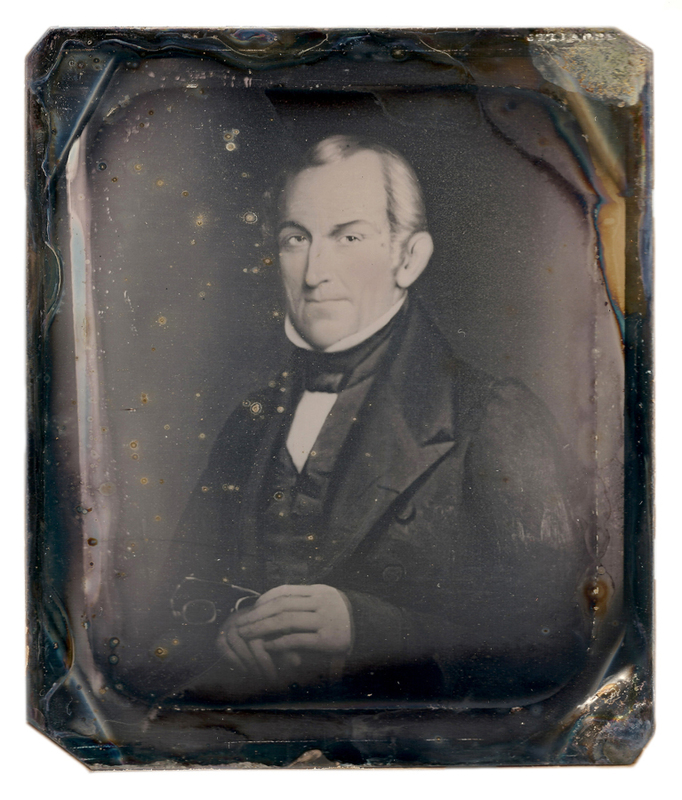 It's also possible the case was bought in 1850, but the daguerreotype was made in 1857, after his passing. image rehoused. But it seems unlikely that Thomas' daughters wouldn't notice and mistake Daniel's image for his. So it's possible we're not looking at a Dusinberre at all. Every image that was sold did belong to the "van der Veers"
in some way, but maybe there was a mix up in notes, and this is someone else from the family.